Don’t look now – the Broncos are tied for first. 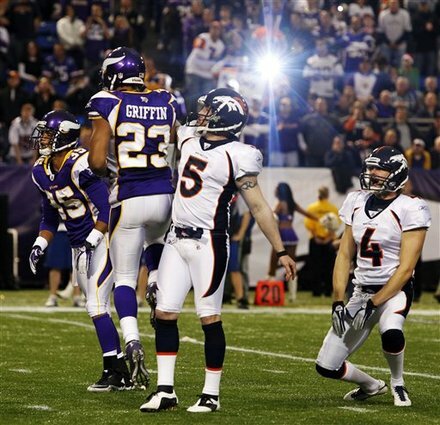 For the second consecutive week, a Matt Prater field goal delivered a victory. And thanks to Tim Tebow, the Broncos keep rolling out inexplicable victories. Prater kicked a 46-yard field goal to tie the game late in the fourth quarter, then booted a 23-yarder with time expiring to give Denver a 35-32 win against the Vikings. Last week, Prater kicked a field goal in overtime to give Denver a 16-13 victory over the Chargers in San Diego. But before that kick, Tebow led several drives to help deliver the victory, and the same was true Sunday. Tebow threw two third-quarter touchdowns to Demaryius Thomas, ran for a game- tying two-point conversion in the fourth, and helped put Denver in position for Prater’s game-tying field goal with 1:33 left in the game. A turnover led to Prater’s game-winner, and the result was another victory for the Broncos (7-5), who have won six of seven since Tebow took over as starting quarterback and are tied with Oakland for the AFC West lead. Five of those victories have come by seven points or fewer. 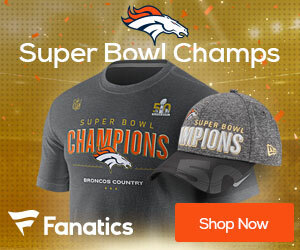 It began with his first start of the season, against Miami on October 23, when he passed for two touchdowns in the final three minutes, and tied the game with a two-point conversion before Prater won it in overtime with a 52-yard kick. Denver was blown out by Detroit the next week, but since then the Broncos have rattled off five in a row. They beat the Raiders by 14, then squeaked by the Chiefs thanks to a fourth-quarter TD pass by Tebow. It was just his second completion of the game. The following week, Tebow ran for a touchdown in the final minute to propel Denver to a 17-13 victory over the Jets. Each win adds to the idea that Tebow possesses some kind of winning touch. In reality, he’s struggled at times, but the Denver defense has kept games close, while Tebow and Prater have come up big in some key moments. Whether or not that’s a permanent formula for the Broncos, it’s made for exciting football. Sunday’s game was different only in that the Vikings’ offense had success against the Denver defense.